The genus Dolomiaea comprises approximately 12 species widely distributed in the southwest of China, and a few are in Myanmar . Previous research has shown that the genus Dolomiaea is a rich source of sesquiterpenes, triterpenes, steroids, phenylpropanoids, and flavonoids. Dolomiaea berardioidea, commonly known as “Hou Ye Chuan Mu Xiang” in traditional Chinese medicine, is mainly scattered in Lijiang, Yunnan Province, China . 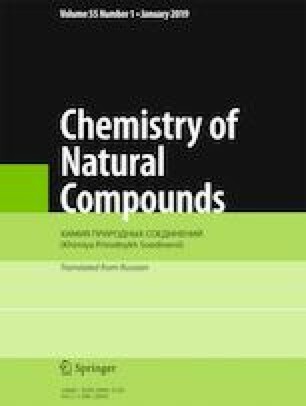 In order to study the bioactive compounds of the whole plants of D. berardioidea, we isolated and identified nine compounds, including five aromatic compounds, three phenylpropanoids, and one monoterpene: trichomanin (1) , 1,2-benzenedicarboxylic acid diisobutyl ester (2) , hydroxytyrosol (3) , 3-methoxy-4-hydroxyphenethanol (4) , 4-hydroxy-3-methoxyphenetyl acetate (5) , umbelliferone (6) , (+)-prinsepiol (7) , (+)-syringaresinol (8) , and vomifoliol (9) . All compounds were obtained from this plant for the first time. Published in Khimiya Prirodnykh Soedinenii, No. 2, March–April, 2019, pp. 270–271.